Barcelona, 5th June 2018.- In recent years it has become evident that the spatial organisation of the genome is key for its function. This organisation depends on a number of factors, the cohesin protein complex being one of them. This essential complex is present in the cells in two versions that contain either the SA1 or SA2 subunit. Scientists at the Spanish National Cancer Research Centre (CNIO), the Centre for Genomic Regulation (CRG), and the Centro Nacional de Análisis Genómico (CNAG-CRG) have addressed the functional specificity of these two variant cohesin complexes. The study, published in Nature Structural and Molecular Biology, analyses in-depth the functions of both variants in 3D genome architecture and shows how the alteration of SA2 influences gene expression and may favour the loss of differentiation in tumour cells. To work out the function of cohesin SA1 and SA2, and try to understand how the absence of the latter favours the growth of tumour cells, the authors have carried out an in-depth study of the 3D structure of the genome using state of the art technologies. “It is difficult to understand how the tumour cell survives and even profits from the absence of one component that, in principle, is essential for its viability”, points out Ana Losada, head of the Chromosome Dynamics Group at the CNIO and one of the leading authors of this paper. The alteration referred to affects the SA2 variant and has been detected in various types of cancer, such as bladder cancer, Ewing sarcoma or in acute myeloid leukaemia. The different role of the SA1 and SA2 cohesin variants in the organisation of the genome has been dissected for the first time ever. “Without knowing the function of each of the variants of cohesin, it is very difficult to decipher its role in carcinogenic processes. This work brings us closer to this objective and is a new example of how the study of the 3D organisation of the genome contributes to a better understanding and characterisation of the regulation of genes” highlights Marc A. Marti-Renom, head of the Structural Genomics group at the CNAG-CRG and co-leader of the study. 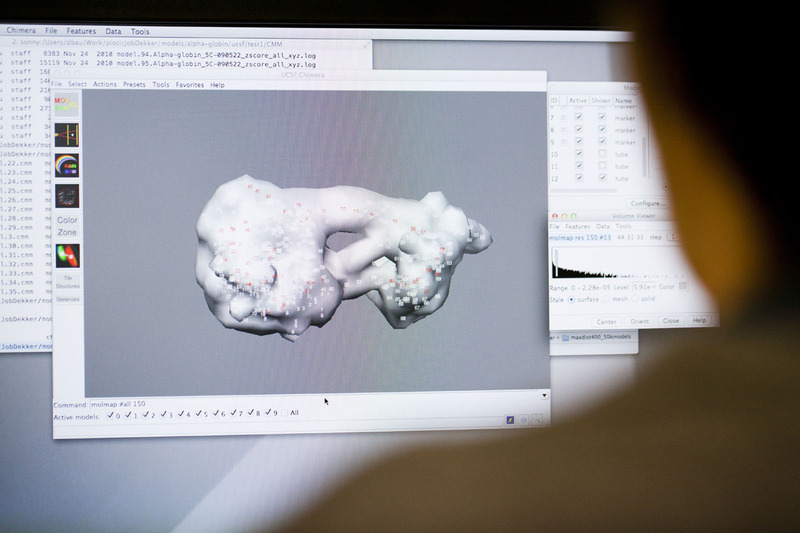 The researchers analysed where each variant is found, their role in gene expression and in the 3D organisation of the genome. “We have applied functional genomics to address the distribution of the two cohesin variants, their enrichment in different regulatory elements of the genome and their co-localisation with other factors involved in genome organisation, and we have interrogated the organisation of the genome in cells in which one or the other variant was absent”, explain Aleksandar Kojic and Ana Cuadrado, from the Chromosome Dynamics Group at the CNIO and fist authors of the study. The results show that the two complexes fulfil different functions. Cohesin-SA1 is important for the organisation of the topological domains, which make up the global structure of the genome, and works always alongside the CTCF protein. However, “the cohesin-SA2 is far more versatile and is capable of interacting with diverse transcription factors to form local chromatin loops that bring together distal functional elements of the genome”, points out Cuadrado. In other words, it is involved in the regulation of gene expression. These findings have led the authors to think that “what SA2 does is to facilitate genomic contacts between regulatory elements and target genes that define the identity of each type of cell. We believe –points out Losada– that the absence of this cohesin variant in tumour cells alters their identity. Importantly, these cells still have the other cohesin variant, SA1, to allow them to survive and carry out cell division”. “Our work is consistent with the conclusion of other CNIO researchers that the mutation of SA2 in tumour cells does not affect cell division. Instead, we suspect that this mutation alters cell identity. It is necessary to start to look for SA2 interactors, and analyse which key genes may be affected by its absence in tumour cells”, concludes Losada. This research has been funded by the Spanish Ministry of the Economy, Industry and Competitiveness, the European Regional Development Fund (FEDER), the European Research Council (ERC), the Horizon 2020 Programme, the Government of Catalonia and the “la Caixa” Foundation.